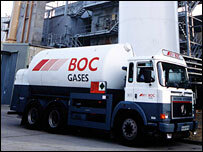 UK industrial gases firm BOC has agreed to be taken over by German industrial conglomerate Linde for £8.2bn ($14.4bn; 12bn euros). Takeover speculation had been swirling around BOC since January, when Linde tabled an offer of £15 a share that was rejected by BOC's board as too low. The deal went ahead after Linde raised its offer to £16 a share, a sum BOC said was good value for shareholders. Linde was "delighted" at the deal and said the firms were "a perfect match". While Linde is based in Germany, it employs about 60% of its 41,000 staff outside of the country and has UK sites in places including Basingstoke, West Bromwich, Aldershot and Merthyr Tydfil. In addition to its gas division, the company also has a business that makes forklift trucks and warehouse equipment. It is also the largest builder of hydrogen production facilities in the world. BOC employs 30,000 people and has two million customers in 50 countries. A number of other UK firms are also being eyed by foreign rivals. UK glass manufacturer Pilkington agreed to be bought by Japan's Nippon Sheet Glass last month, and shipping and ports company P&O is currently being taken over by Dubai Ports World. At the same time, airport group BAA is being stalked by a Spanish suitor.